I’m so excited to bring you some samples and inspiration from the brand new Stampin’ Up Handmade for the Holidays mini catalog. This catalog is filled with stamps, papers, die cuts, kits and embellishments to help you create the perfect cards, party decor and gift wrapping for the upcoming holiday seasons. You’ll find woodland style stamps and papers perfect for Fall, fun and spooky images for Halloween and Christmas and Winter designs that are cute, elegant and retro. There are also many new collections of Designer Series Papers with matching embellishments like washi tapes, wooden shapes, paper clips and ribbons. Several projects kits match up with stamp sets to create gift tags and home decor projects. You’ll also find Thinlits Dies and Embossing folders that work perfectly with many different stamp sets too. 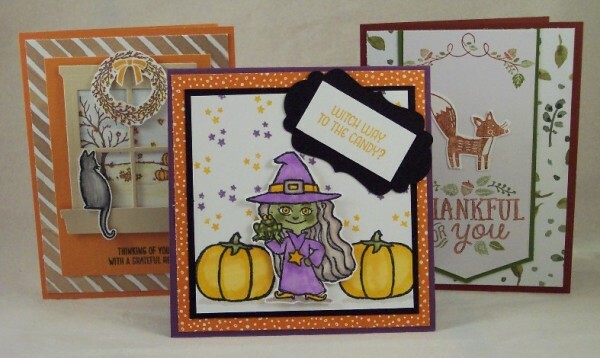 Today I’m sharing with you a few Fall and Halloween cards I’ve made using some of the new holiday products. I’ll be sharing more ideas (including Christmas and Winter in the coming weeks so be sure to check back). 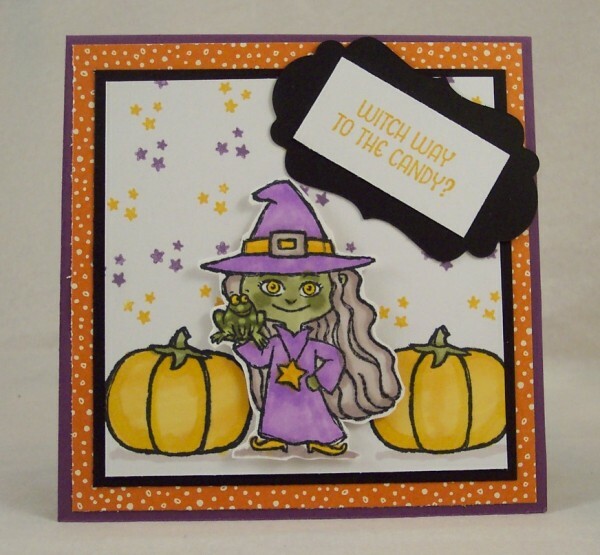 For my first card I used the cute little witch from the Haunt Ya’ Later stamp set, adding some of the pumpkins from the set behind her. I love her little froggie friend! I used paper from the Sweet Little Things Designer Series papers (found in the regular Stampin’ Up catalog). And the stars are from the Made with Love set (also in the regular catalog). Next I created a scene using the Hearth and Home Thinlets Dies window set that goes with the Happy Scenes stamp set for my outside view. I also added the cat and wreath from the Festive Fireplace stamp set. These stamps and dies coordinate together for endless possibilities. I used an Aqua Painter and water color pencils to color my images and the paper is from the English Garden series. 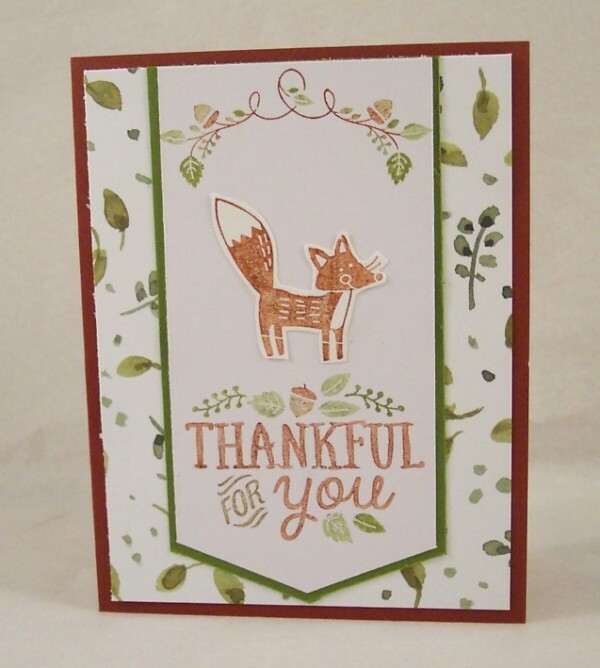 Lastly I made this fun woodsy card using words and the fox from the Thankful Forest Friends stamp set. This set is going to quickly become a favorite of mine with it’s adorable woodland animals! I used markers to directly color on the rubber of my stamps, this easy technique allows you to add color to solid stamps. The paper I used is from the English Garden pattern papers (found in the regular catalog). You can view and purchase all these fantastic new Stampin’ Up products today by visiting their website or contact your local Stampin’ Up demonstrator to place an order. If you don’t have a demostrator you can find one here.